Judaism in India is now only a small outpost of the faith. 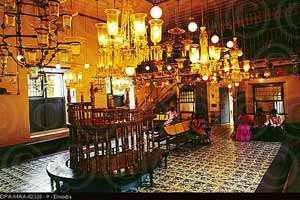 But for Mumbai, which houses a thriving Jewish community of about 5,000, the Jewish population is in decline everywhere in the country, as it has been since the establishment of the state of Israel in 1948. But even so, the significance of India in the history of Judaism is immense. The reason for this is that while Jews were an embattled and persecuted people for thousands of years, culminating in the tragedy of the Holocaust, India was always a safe haven for Jewish migrants, the first wave of whom are thought to have arrived in India as early as AD 70, after the sacking of Jerusalem by the Romans. Judaism took root in south India and eventually became part of the weave of India’s multi-religious fabric, contributing synagogues and sabbaths to the vast panorama of Indian architecture and ritual. In fact, the crisis of Indian Judaism, as Edna Fernandes shows in her book The Last Jews of Kerala, is not a result of anti-Semitic sentiment but rather because of cracks in the house of Judaism itself. For hundreds of years, the Cochini Jews, as the Jews of Kerala are commonly known, have stubbornly enforced an internal division that has slowly sapped the strength of the community. The issues that have debilitated the Jews of Kerala are those old human failings: irrationality, pettiness, sectarianism, racism. Fernandes arrives in Kerala to find a belated, and now probably irrelevant, truce between the so-called White Jews and Black Jews, adversaries for centuries. The Black Jews, who are of darker complexion and mixed lineage, trace their origins in India back to the days of King Solomon. The White Jews are mostly Jews of European origin, who appeared in the 16th century, fleeing religious persecution. Arriving on the Malabar coast to find a group of older yet foreign Jews in Cochin, they set up their own settlement, prized their racial purity and gradually annexed the centre of Indian Judaism. Over time, a Jewish apartheid fell into place; marriage, worship and social interaction in an already small community became ghettoized. In the 1940s, there were about 2,000 Jews in Cochin; now there are a hundred or so Blacks and only a dozen elderly Whites. Fernandes finds the mood among the Whites dire, their homes desolate. There is no prospect of a new generation, and they live in the twilight not only of their own lives but of their community’s history. The Blacks are somewhat better off but they, too, are aware that the end is not far. Fernandes’ deployment in narrative form of her research into Indian Judaism is just about adequate, and in her descriptions of the sights and sounds of Cochin she sometimes overwrites (as when she calls one dashing Jewish couple the “Ash and Abhishek" of the community). The spark that the reader really takes away from her book is a sense of empathy with a number of characters whose speech, world view and dilemmas are vividly realized. There is Sarah Cohen, an elderly White Jew, whom we see mourning the recent death of her brother, pushing an imaginary plate towards Fernandes at the dinner table as she used to towards him. We meet “Babu" Joseph, a middle-aged Black Jew, explaining why he went to Israel but then returned home when he realized that he was not only staunchly Jewish but also Indian. In Israel, Fernandes meets Abraham, an elderly man in his 70s, who has spent three decades in Jerusalem as a committed Zionist. Yet, Abraham wants to migrate back to Cochin, the place of his birth, because he cannot live with the ferocity of the conflict with Palestine. These are complex stories, told in a way that brings out their many dimensions, and showing how human beings always live in a kind of dialogue with history. Fernandes seems to exaggerate slightly when she ascribes the decline of Judaism in India to the conflict between the White and Black Jews. In reality, it was an accident of history, the “new exodus" of Indian Jews to the long-awaited Jewish homeland of Israel, that dealt the death blow to the community. This becomes evident when Fernandes lands in Israel to find a thriving community of about 5,000 Jews of Cochini extraction, some with ambitious plans to set up a museum that enshrines their Indian past. 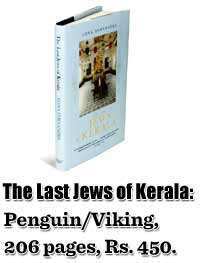 The last Jews of Kerala are not to be found in Cochin, but in Israel.